A call option is the right to buy a certain quantity of a given asset or commodity for the specified Strike Price before the Expiration date of the option contract. 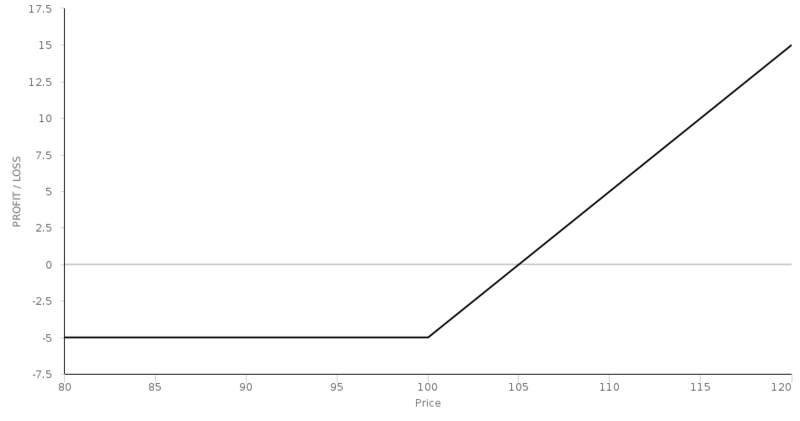 Purchasers of call Options expect the price of the Underlying security to rise or stay above the Strike Price so they can acquire it for less than the market value and earn a profit from the difference. Call buyers are referred to as being Long of calls. In addition to buying calls, call option writers can sell call Options, this is known as going Short. Buyers of Call Options are sometimes referred to as being Bullish about the prospects for the security or commodity. Conversely, sellers of call Options are Bearish about its outlook. Note that due to the ability to both buy and sell call Options, it is possible to be either Bullish or Bearish when trading Calls. The opposite position to call Options is a Put Option where the owner of the option expects the price of the asset or commodity to fall. These have similar characteristics and it is possible to be both Long and Short puts (or Bearish and Bullish) about them also. Basic introduction to option contracts, including calls and puts. Investopedia article and video which explains call options. Simple tutorial on buying Call Options.